This is an absolutely fabulous beaded trim that will be sure to get attention! 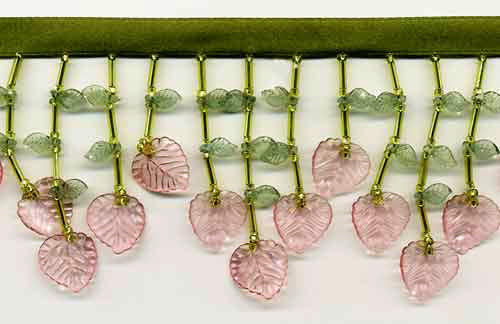 Soft and transparent leaves of pink and green sway playfully along sparkling gold bugle and seed bead stems. This is a high quality, very full beaded fringe with exceptional detail and craftsmanship. The longer beaded stands are 2 3/4 " long, including the 1/4" green satin ribbon.